Wet rooms have become very fashionable in Europe over the last 10 years, with more and more people making the switch from conventional shower trays or bathrooms. In this article we examine the pros and cons of wet rooms and have a look at the various design aspects that should be considered. Level access – There is no step up into, or out of the shower tray, but instead a gradual slope is created from the edge of the shower area towards the waste position. Fully tanked room – The entire floor area (with a turn-up of 100mm onto the walls) plus the complete wall height in the immediate shower area are tanked (waterproofed) with an approved waterproofing system. With a conventional shower tray only the tray itself is waterproof and water can often track around the edges of the tray, leaking into the area underneath. Drainage System – In a wet room the waste outlet is positioned at the lowest point in the room, it also has a clamping system for sealing to the waterproofing. The trap is removable from above, meaning that it can be maintained in case of a blockage without disturbing any of the tiling or other finishes. Aesthetics – Probably the main single reason that people choose wet rooms is the way they look. Wet room designs tend to be very uncluttered. The chosen floor finish continues throughout, including the wet area of the shower. Any screens included are normally simple and minimalistic, often with a milled glass leading edge and very little by way of metal or plastic frames and trims. Splashes – As the shower area is not fully enclosed water will splash over a fairly large area during showering. This is fine from a waterproofing point of view as the entire room is tanked, but can be annoying if you’re not used to it. If you leave towels or clothes lying on the floor, they will get wet. If you have a toilet close to the shower then the seat may get wet. This may not be a problem if you have a large room, but for smaller wet rooms I would encourage the use of a well-placed shower screen to deflect the worst of the splashes. After showering you will probably want to squeegee any excess water back towards the shower area. This is just part of the wet room showering routine, but if having a wet floor is something that would irritate you, then either go for a traditional shower tray or create a wet room area with a more conventional, fully enclosed glass surround. The situation can also be significantly improved by including underfloor heating, which will dry out any stray water droplets quite quickly. Cost – Depending on the location and the type of construction a wet room can cost more money to install than a conventional shower tray. The floor in the shower area has to be” sloped to falls” so that water can run down towards the waste outlet. 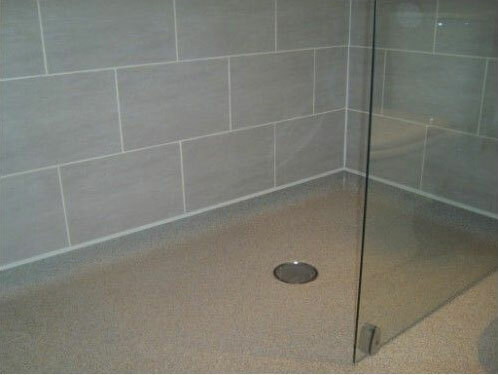 On a concrete surface this slope can be created within the floor screed, but on a joisted wooden floor a shower tray former is normally used. A shower tray former has a slope to falls already built in. It is simply fixed over the joists, waterproofed, then tiled over. Most manufactures have several different “off the shelf” sizes of former which are quite inexpensive, but if you require a made to measure solution the price will almost certainly be more than for a conventional shower tray. In addition to a shower tray former, you will also need an approved waterproofing kit. These are normally quite reasonably priced, but if you have to pay an approved installer the cost can vary quite a lot depending on your location and in all cases will be an additional expense over and above a traditional shower installation. 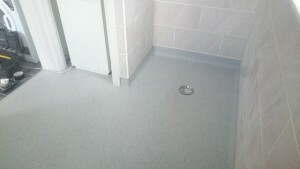 Flooring -Wet rooms normally have either a tiled floor finish or a vinyl flooring system with hot-air welded joints. Traditionally vinyl flooring has been mainly used in the care sector, such as in hospitals or nursing homes, but this distinction is becoming blurred as many people needing disabled access now choose the upmarket feel of tiles. On the other hand the range of different styles and colours of vinyl flooring has increased massively in recent years to give a very wide choose. Vinyl floor systems are also seen as being very low maintenance compared to tiling (no grout to clean). It is now quite common to remove a bath and replace this with a wet room shower. This can be a practical home improvement but should always be considered very carefully, as removing the only bath in a family residence could devalue the property or at least make it harder to sell, whereas in a studio apartment it would almost certainly have a positive effect. As with most home improvements, it is basically down to personal taste. If considering a wet room think about your budget, the length of time you are likely to stay in the property and the effect on value. Normally a well fitted attractive wet room en-suit will enhance value, whereas a bath replacement project could affect the value either positively or negatively depending on the type of property and the area that you live in. If deciding to go ahead with a wet room installation then please ensure that the person carrying out the work knows what they are doing. The installation is not difficult and can be carried out by either a professional bathroom fitter or a competent DIYer, but in either case they must have the knowledge of which products to use and how to layout the room. The good news is that there is now plenty of knowledgeable expert advice available, just make sure that the person you’re talking to is an expert and has the necessary experience. Some wet room product suppliers keep lists of approved installer, or have a free advice service. So if you’re seriously considering installing a wet room this would probably be a very good place to start. 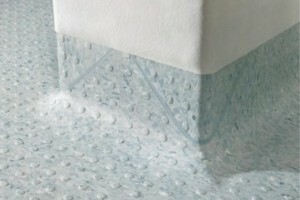 At DFS Glasgow we can give you expert advice regarding your new wet room floring. If you would like some free advice, or a quotation, please contact us on 0141 621 2990 or you can email us info@dfsglasgow.co.uk We are always happy to help.